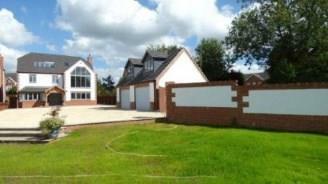 5 Bedroom Detached House For Sale in Leicester for Offers Over £700,000. This spectacular home benefits from gas central heating and being double glazed through-out. The accommodation comprises entrance hall, living room, office, kitchen, utility room and WC. On the first floor there are four double bedrooms, two en-suites and a family bathroom. On the third floor there is the master bedroom with a shower room. Outside the property benefits from a lovely landscaped garden, double garage and off road parking. Spencers advise early viewings to avoid disappointment .